Lion Corporation (President: Itsuo Hama) announced today the nationwide release on Wednesday, August 22, 2012 of platius beautiful teeth cleaner—a toothbrush for highly beauty-conscious women who desire to look radiant every day that uses new ultrafine, high-density bristles and sonic vibrations to gently remove dullness buildup1—and platius beautiful teeth essence,2 a dental rinse that helps users prevent dullness buildup simply by rinsing. ■“Beauty toothpaste” that cares for teeth in the same manner as skincare has become popular among women. Lion’s beauty aging care paste, platius creamy up paste helps restore the original beauty of teeth through daily oral care by dislodging the dullness buildup that increases their visual age. Accordingly, platius creamy up paste has gained the support of a significant number of women who have made brushing teeth a part of their daily beauty routine. 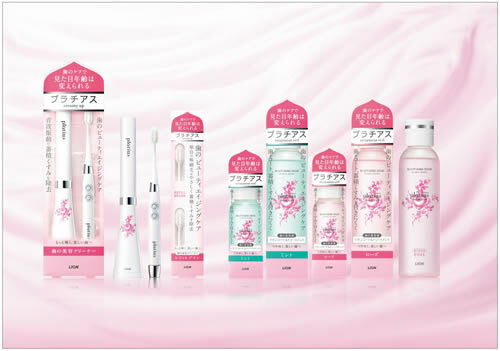 Since its release in February 2010, platius creamy up paste has surpassed cumulative sales of four million tubes (as of July 2012), driving the market expansion of high-end whitening toothpaste priced at ¥500 or above. According to a Lion survey, women who use platius creamy up paste brush their teeth for an average of six minutes and eight seconds each evening, nearly twice as long as women who use regular toothpaste. In addition, we received comments from respondents that include: “Brushing with this product allows me to have a leisurely beauty care experience while watching television” and “the fine foam and rose fragrance gives me a luxurious feeling.” This feedback clearly indicates that “beauty toothpaste” has become very popular. There is increasing desire among women who use “beauty toothpaste” for oral care products that are offered in the same way as cosmetics. In response, Lion will release platius beautiful teeth cleaner and platius beautiful teeth essence, which, in combination with platius creamy up paste, offer a three-step process to maintain beautiful teeth. Step 1: Coat the teeth with platius creamy up paste to dislodge dullness buildup. 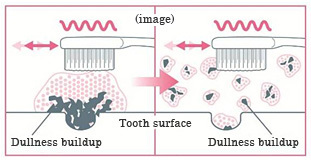 Step 2: Use the ultrafine, high-density bristles and sonic vibrations of platius beautiful teeth cleaner to effectively remove the dislodged dullness buildup. Step 3: Rinse with platius beautiful teeth essence to maintain beautiful teeth and protect against dullness buildup. Through this set of three platius brand oral care products, Lion proposes “Tooth Beauty Step Care,” a new concept similar to skincare that turns daily brushing into a spiritually enriching beauty care ritual. The fine creamy foam envelops teeth, making it possible to dislodge and lift away dullness buildup while guarding against cavities and gum inflammation. The ultrafine, high-density bristles and sonic vibrations of platius beautiful teeth cleaner make the foam of platius creamy up paste even finer and creamier to envelop tooth surfaces and effectively remove the dislodged dullness buildup. Simply rinsing with platius beautiful teeth essence after brushing coats tooth surfaces with a mild liquid that prevents dullness buildup to maintain and protect shiny healthy teeth. The ultrafine, high-density bristles and sonic vibrations of platius beautiful teeth cleaner make platius creamy up paste foam even creamier to gently and pleasantly remove dullness buildup. (1) The high-density bristles and sonic vibrations create creamier and more pleasant foam. platius beautiful teeth cleaner uses Lion’s proprietary ultrafine, high-density bristles, which combine 0.02mm super-tapered bristle tips with high-density bristles. The toothbrush’s sonic vibrations make the foam of platius creamy up paste even finer and creamier, spreading the rich and pleasant foaming sensation throughout the oral cavity. Simply by manually3 spreading the creamy foam of platius creamy up paste with this toothbrush over the teeth envelops and dislodges stubborn dullness buildup. The soft pleasant bristles and sonic vibrations gently and effectively remove the dislodged dullness buildup. Decorated with a colorful rose motif, platius beautiful teeth cleaner features a beautiful upright stand for storing the toothbrush, lending a stylish, elegant atmosphere to the area surrounding the bathroom sink. Simply rinsing with platius beautiful teeth essence dental rinse after brushing keeps the oral cavity clean and prevents dullness buildup. (1) The mild liquid and soft flavor provide a luxurious and pleasant sensation. · Rinsing after brushing with platius beautiful teeth essence gives the feeling of having had a deep massage while enjoying the pleasant soft flavor along with a thick gentle liquid sensation similar to that of liquid skincare products. (2) The top coat ingredients prevent dullness buildup to maintain and protect shiny healthy teeth. The top coat of platius beautiful teeth essence contains sodium tripolyphosphate (TPP), a cleaning agent that uses an “ion coat formula” to block dullness buildup, coating the microscopic dimpled surface of teeth. With a colorful rose motif, platius beautiful teeth essence features a bottle similar in appearance to that of a skincare cosmetic, lending a stylish, elegant atmosphere to the area surrounding the bathroom sink.